Multi-talented gospel music singer, Somi Afeso started her music journey as a teenager in the choir but is officially releasing her first single. Her passion for music brought her to various leadership positions in different music platforms in both Campus and Church ministries of Christ Embassy. She presently handles different leadership positions in her local assembly (Christ Embassy). Somi is professionally an accountant, but also a natural comedian, experienced businesswoman, loving wife and a caring mother. 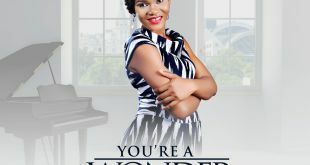 After an impartation from Pastor TT Edun in 2005, Somi’s music ministry experienced an offshoot, with the Holy Spirit as an inspiration for all her songs . ‘YOU’RE A WONDER’ refers to the magnificent personality of Jesus Christ. The song will usher you into a beautiful state of tearful worship. Download, listen and share the link. God bless you.